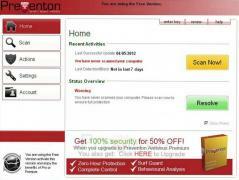 Preventon Antivirus, is a comprehensive security solution using professional technologies, but designed for home PC users. It's equipped with a state of the art antivirus engine to ensure your computer and data is safe from all threats. - Preventon Antivirus is using the powerful Prevention detection technology, designed to always stay one step ahead all kinds of digital threats. - The real-time scanning modules verifies files at creation and whenever they are opened or copied, instantly detecting any kind of suspicious behavior. - The program is capable of scanning external storage devices and remove any viruses from the infected ones. - Multiple options for scheduled scanning lets you set up the scan times and other settings exactly how you want. - The application includes several, powerful anti-malware engines for scanning to provide the highest level of protection.